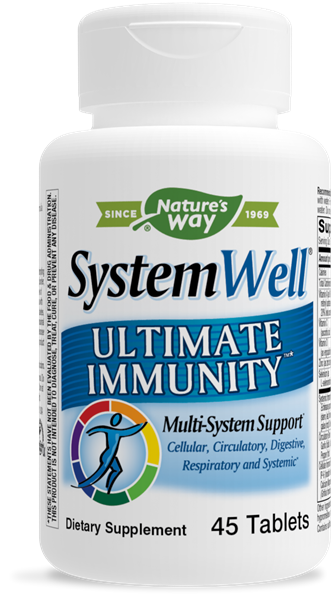 SystemWell Immune System / 45 Tabs - Nature's Way®. For Intensive Use: Take 3 tablets up to twice daily with water. For Daily Maintenance: Take 1 to 2 tablets daily with water. Do not use this product if pregnant, nursing, or attempting to become pregnant. Do not exceed recommended dosage per day. Do not use if you have a bleeding disorder, are within a week of any surgical procedure, or are taking blood-thinning medication. If taking any other medications, have a kidney disorder, diabetes, or high blood pressure, consult a healthcare professional before use. Not recommended for individuals with autoimmune conditions. Persons with allergies to plants of the Asteraceae (Compositae) family, including ragweed, should use this product with caution.